When I spotted these cute Cupcake Tea Set, I knew instantly they would be a fantastic way to engage in sensory play with my son, and couldn’t resist creating a Tea Cup Sensory Bin. Setting up this sensory activity was quick and easy. 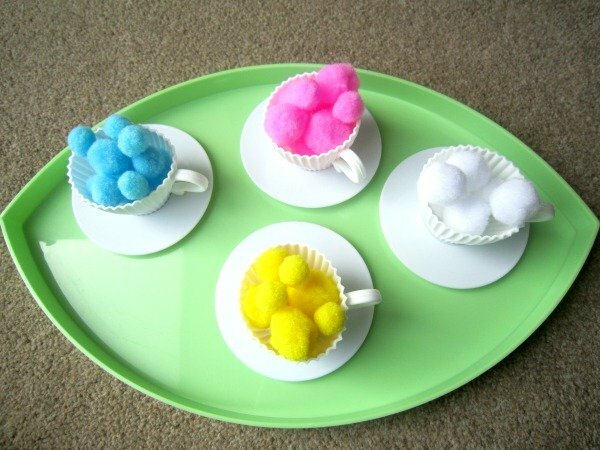 I simply placed assorted pom poms of different colors and sizes in a deep tray, and on a separate tray, I added the four teacup-shaped silicone moulds, along with their saucers. Finally, I gave my son a selection of different fine motor tools to explore the sensory bin. 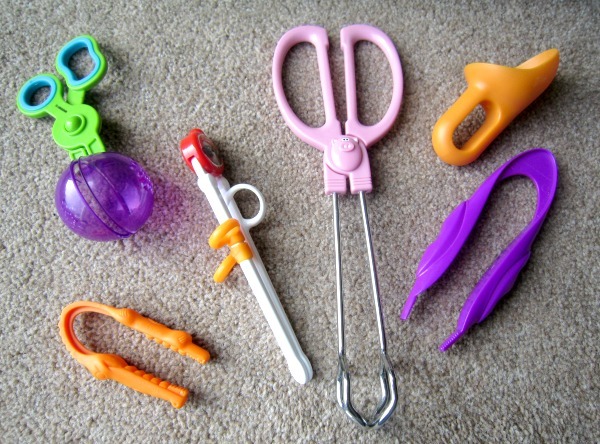 These included the Gator Grabber Tweezers and the Handy Scooper from our Learning Resources Helping Hands Fine Motor Tool Set, a set of Cleverstix Chopsticks, Piggy Wiggy Serving Tongs, an ice cream scoop and a pair of Learning Resources Jumbo Tweezers. 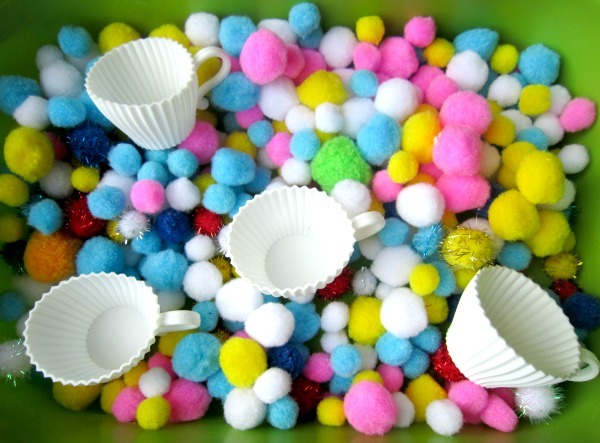 My son had a wonderful time pretending that the coloured pom poms were tea, whereas the white pom poms were sugar cubes, and kept asking me how many items I needed in each cup. 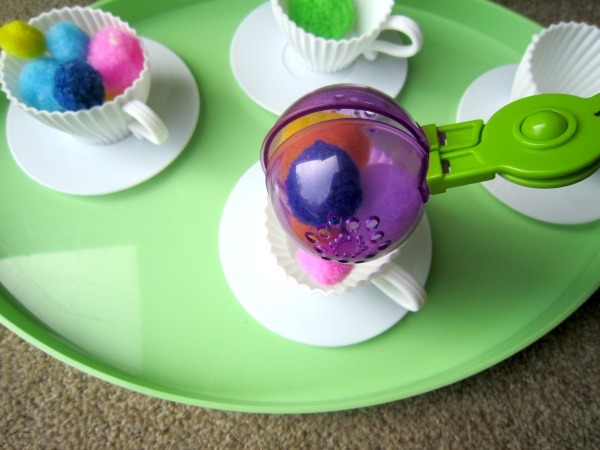 The fine motor tools proved a huge hit in transferring the pom poms from the sensory bin into the tea cups – the Piggy Wiggy Serving Tongs were great for moving the larger pom poms, whereas the Handy Scooper could transfer many pom poms at a time. And while my son struggled to use the Jumbo Tweezer as he couldn’t grip the pom poms, he found the Gator Grabber Tweezer much easier to use. The orange ice cream scoop was brilliant for pouring out many pom poms out at a time; however, his preferred method of transferring the pom poms was using the CleverstiX. He then turned his attention to colour sorting the pom poms. 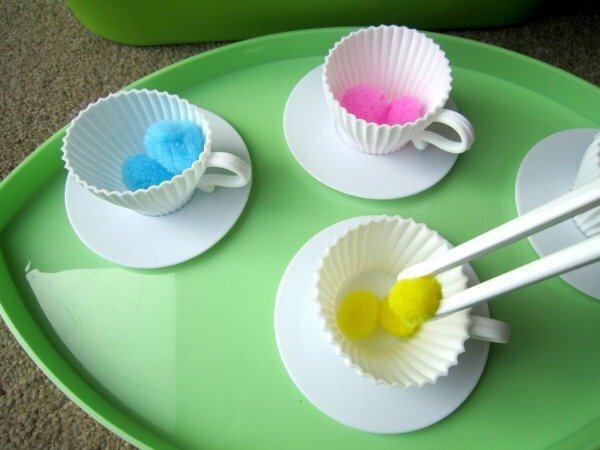 He allocated a different colour to each tea cup and transferred the pom poms using the fine motor tools. Who knew our Tea Cup Sensory Bin would be such a hit?! I think we’ll try it again in May as I feel it would make a fabulous Mother’s Day activity. Who doesn’t enjoy an afternoon tea party with their little one? 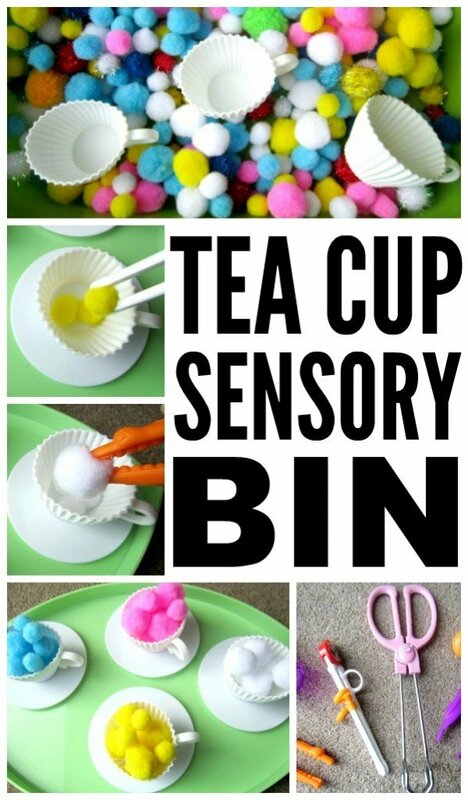 If you liked this Tea Cup Sensory Bin, please share it on Pinterest! And if you’re looking for more ways to have fun with your kids, please follow our Kids board where we share all kinds of great ideas! During a difficult pregnancy suffering from Hyperemesis Gravidarum (HG) Emma vowed to make every day an adventure once she had recovered. Her blog, Adventures of Adam, is the outcome of completing a 100 day play challenge with her toddler as part of that promise. Emma has a section dedicated to HG friendly play activities so that Mums can still be part of their children’s play whilst they are ill.